Action Comics No.1 (1938), the first appearance of Superman, created by Jerry Siegel and Joe Schuster. Earlier this week Action Comics No. 1, which features the first appearance of Superman, sold online for a record-breaking $1m (£640,000). This event marks an important cultural milestone in media for a few different reasons, all centered on some notion of populism. 1. Internet commerce. The comic was sold through one of the many successful but niche, mom’n pop auction websites borne by the internet age — ComicConnect.com. Unprepared for heavy traffic after news of the sale spread, the site was down yesterday, except for a press release. From this perspective, Action Comics No. 1’s sale highlights how far internet e-commerce has come. Less than five years ago, making purchases on the internet was a scary thought to many, especially those 55 and older. And the notion that someone would spend up to a $1m on a less-than-secure-looking, website for a comic book would be laughable. Shortly after I wrote this post, Detective Comics No. 27 (1939), which features the first appearance of Batman, exceeded Action Comics No.1's sale price, going for $1.08m. ComicConnect.com’s big sale is indicative of a broader trend toward trusting non-big brand e-commerce sites, a sentiment ushered in by trailblazers like eBay and innovated by upstarts like Threadless. As trust in online purchasing burgeons and apprehension dissolves, the internet’s democratization of information will have increasingly populist effects on e-commerce, providing a relatively level playing field for any who aim to sell their wares to the internet’s vast audience. 2. Comic books as high art. Long before recent ventures into new formats, comic books were one of the first popular forms of multimedia art, combining elements of literature and visual art in one medium. For much of their history, however, comic books have been regarded and treated as a low-brow form of children’s literature. 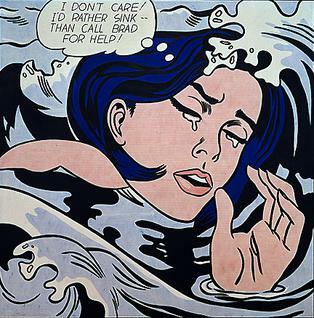 But, with the conceptual treatment of mass-produced art in the pop art movement, some artists (like Roy Lichtenstein) took style elements from the medium’s early practitioners and elevated it through their own critically-acclaimed work. Separately, as many who witnessed comic books’ maturation as a medium are now grown up, academia and other ‘elite’ cultural arbiters have started to treat comic books with some intellectual respect, instead referring to them as ‘graphic novels.’ Action Comics No. 1’s sale marks an important step in elevating a medium to high art: someone paying a boatload of money to acquire a piece of it. Roughly tripling the past highest paid sum for a comic book, the purchase puts comic books in the big league. Hell, auction house Christie’s online hub places the upper end of the price filter for paintings at $600k. 3. The story of Superman and his creators. After five years of failure and waiting, Jerry Siegel and Joel Schuster published Action Comic’s No.1 through National Allied Publications. As two young Jewish men in the American midwest during the early stages of WWII, Siegel and Schuster aimed to create a just and powerful embodiment of their frustration with a world that they perceived as unjust and unlistening to the plights of the powerless. Each, too, had personal stories that contributed to Superman’s inception. Siegel’s father was killed in an armed robbery, and Schuster was refused from military service due to his horrible eyesight. Among the things that made Superman popular was his fight for social justice, rather than law and order. The Superman of late 1930’s had no qualms about doing all sorts of illegal things in order to right what he felt were wrongs. This included getting confessions out of crooked politicians by threatening to injure or kill them, kidnapping and forcing weapon makers into fighting on the front lines of a war and trapping a Mining Company owner and his rich friends in an unsafe mine that his employees worked in. Some people would criticize Superman and superheroes in general because of these types of stories, saying they taught “might makes right” and were fascist. And further, as others note, Superman’s experience resembles, in some ways, the plight of unpopular teenagers in high school and Jewish people trying to adapt to an anti-Semitic society. Like their presentations of self to society at large, the character is Clark Kent, and Superman puts on a ‘mask’ (glasses & street clothes) as his disguise as a normal person. To end, I’ll leave you with a favorite painting of Superman by Alex Ross, one of my favorite ‘graphic novel’ artists. As my vernacular would suggest, I’m a bit of a comic book geek (, which would also explain why I’d write this post…). Alex Ross' version of Superman. Note: This post was written days before the sale of Detective Comics No. 27, which features the first appearance of Batman. While Batman’s story is certainly less populist in content (given Bruce Wayne’s elite upbringing and place in life), points 1 and 2 of this post remain extremely relevant. Not only that, but many might posit that, like Superman, ‘Bruce Wayne’ is Batman’s disguise, and Batman is the true character. The transaction was conducted through the auction site ComicConnect.com. Stephen Fishler, the co-owner of the site and its sister dealership, Metropolis Collectibles, orchestrated the sale. Fishler said the seller was a “well-known individual” in New York with a pedigree collection and the buyer had previously bought an Action Comics No1 of lesser importance. Dolmayan, who owns Torpedo Comics, paid $317,000 for an Action Comics No1 issue on behalf of a client last year. Very in depth and interesting post. When I first heard of the sale I immediately thought of it's archival nature. I'm a print designer and watercolor painter and use only acid free paper when painting. I am use to seeing comics only on newsprint. Not sure what the stock was in 1938, but my guess is not 100% acid free rag. I picture the buyer keeping their purchase in an air controlled light free space. Glad print is popular again and worth 1M! Thanks for the well written read. Thanks for both reading the blog and the kind words. I'm glad that you found it interesting. I've also often wondered how older, less archive-friendly works like these stay in such good condition over time. I think your intuition on how they are preserved is probably right. A bit of cursory research revealed that, during the grading process of the comic book's condition, they are also placed in a sealed sleeve, which I imagine must also be airtight. Here's a link with information about the process. Thanks again, Jan, and hope you continue following the blog! Detective Comics No. 27 (1939), starring the debut of Batman, just sold for $1.08m, outdoing Action Comics No.1's sale for $1m. Heritage Auction Galleries says a 1939 comic book in which Batman makes his first appearance has been sold at auction in Dallas, Texas, for $US1,075,500 ($A1.21 million) - a record for a comic. Detective Comics No. 27 was sold on Thursday on behalf of an anonymous consignor. The buyer also wished to remain anonymous. Barry Sandoval, director of operations of Heritage's comics division, said the consignor bought the comic in the late 1960s for $US100. On Monday, a copy of the first comic book featuring Superman sold for $US1 million in a sale between a private seller and buyer. The comic was a 1938 edition of Action Comics No. 1. Great post. It's true that graphic novels and comic books have become "mature" and is now accepted by mainstream society as a form of ART. The same can be said for films-- people used to sneer at the concept of film as "art" when films first appeared as a form of ENTERTAINMENT for the mass audiences. Thanks for the kind words, DIMA, and thanks for following the blog. You're absolutely right about films, though I tend to think that many practitioners of film-making took their medium more seriously than comic book writers and artists. I think it's probably fair to say that, unlike filmmakers, comic book writers, in particular, did not see the full creative potential of their medium. Comic artists, on the other hand, were constrained by the printing limitations of the day; their depth of their artistry was often lost in the poor quality of older printing presses. Even know, this problem persists, though to a lesser degree. Also, I think the demographic for comic book creators was initially much different than filmmakers. Whereas filmmakers had an extremely broad audience, comics were initially geared toward a younger audience. Thankfully, as mentioned, treatment of the medium has matured. Thanks again for reading, and I hope to hear from you again! The art is better than ever. The paper is better than ever. But nothing beats nostalgia like old comic creators and the ilk. Great story. I certainly agree that the artistry and quality of materials of graphic novels/comic books is better than ever. My nostalgia, however, leans toward reading comics from the early 90's, during the height of X-Men titles and the rise of Image Comics. It wasn't until later in life that I began to go back toward older issues, and then immersed myself in the work of the Modern Age of Comics -- e.g., Moore, Miller. While I don't think I'm going to change the Superman picture, given the focus of the post, I'm happy to add the picture of Detective Comics No. 27 and post-script note about the Action Comics No. 1's sale price being superseded. BAD, thanks for sharing your thoughts on the piece, and thanks for following the blog. I'm glad you enjoyed the pop art reference, and look forward to your comments in the future. Personally I'm impressed by the quality of this. Generally when I come across these sort of things I like to post them on Digg. This article probably won't do well with that crowd. I'll take a look around your site though and submit something else.